The Slovak Republic is a landlocked state in Central Europe. It has a population of over five million and an area of about 49,000 square kilometres (19,000 sq mi = about twice the size of New Hampshire). Slovakia is a landlocked country bordered by the Czech Republic (165 mi/265 km) and Austria (79 mi/127 km) to the west, Poland (371 mi/597 km)to the north, Ukraine (61 mi/98 km) to the east and Hungary (421 mi/678 km) to the south. The largest city is the capital, Bratislava, the second largest is Košice, the third largest is Prešov. Slovakia is a member state of the European Union, NATO, United Nations, OECD and WTO among others. The official language is Slovak, a member of the Slavic language family. 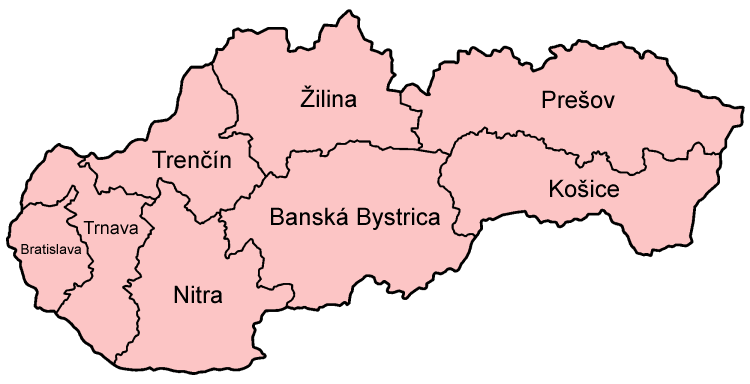 Slovakia is subdivided into 8 regions ("kraj" = region), each of which is named after its principal city. The Slovak landscape is noted primarily for its mountainous nature, with the Carpathian Mountains extending across most of the northern half of the country. Amongst these mountain ranges are the high peaks of the Tatra mountains. To the north, close to the Polish border, are the High Tatras which are a popular skiing destination and home to many scenic lakes and valleys as well as the highest point in Slovakia, the Gerlachovský štít at 2,655 metres (8,711 ft), and the country's highly symbolic mountain Kriváň. Major Slovak rivers are the Danube, the Váh and the Hron. The Tisa marks the Slovak-Hungarian border for only 5 km (3.1 mi). The Slovak climate lies between the temperate and continental climate zones with relatively warm summers and cold, cloudy and humid winters. The average daily temperature is 28°F (-2°C) in the winter and 77°F (25°C) in the summer. The coldest month is January and the warmest months are July and August.